114 pages, 5.5" x 8.5"
"Silent Killing" was the name given to the lethal techniques for dispatching Nazi sentries and other German troops that close-combat masters W.E. Fairbairn and E.A. Sykes taught to Allied soldiers, paratroopers and commandos during World War II. These quick, brutal techniques were so effective that the German Army Command was forced to develop counters to what they termed "English Gangster Methods". This extremely rare manual was printed in 1942 for German troops in occupied Norway and is not believed to have been distributed outside that country. It remained largely unknown until rediscovered in 2001. 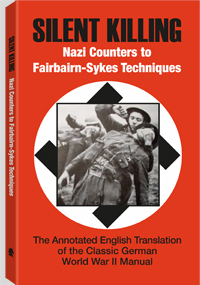 Silent Killing - Nazi Counters to Fairbairn-Sykes Techniques is the first English translation of the German wartime manual. It contains the original German text and photos, the English translation and annotations, and an extensive foreword by British combatives researcher Phil Mathews, which provides valuable new information about the origins of the manual, how the Germans obtained the "secret" Allied training documents and the state of close combat instruction in Germany and Britain before and during World War II. The historical value of this manual for students of World War II, Fairbairn and Sykes, and hand-to-hand combat is immeasurable.